The musicians of the Seattle Symphony and its administrative people are on a collision course. Read this article in the Seattle Times and this analysis by Zach Carstensen in The Gathering Note. I recommend reading the Times article first for some basic background and then Carstensen's article for analysis and also for readers comments. Addendum: Tim Hale, the chair of the Seattle Symphony & Opera Player's Association has written the players take on the situation here. Drew McManus, Mr. Adaptistration and one of the must astute observers of the orchestra world, posts additional commentary on his website here. It would be much better for Seattle to find the money to back its players and their vision to be a top-tier orchestra. The deadline for the Vancouver Symphony's Young Artist competition is coming up very soon. This Monday, January 4th, is the last day that participants can turn in their forms and recordings for consideration. Music students 18 years (by January 1, 2010) and younger - from SW Washington and the Portland metro area) compete in piano, strings or brass/woodwinds/percussion. A panel of judges selects the competition finalists and winners perform with the Vancouver Symphony Orchestra at its April concert. The entry fee is $25. Winners also receive a cash award: First prize: $1,000; Second prize: $500; Third prize: $250. I've been taking a break from the reviewing scene, but my colleague Stephen Llewellyn has filed several reports from concerts he attended over the past week, including Portland Baroque's Messiah concert, the Portland Youth Philharmonic concert, and the Met's "Les Contes d'Hoffmann" at the movie theater. You can read Operaman here. My interview with David Hoerz,the chief sound technician at the Arlene Schnitzer Concert Hall, is posted at Oregon Music News. I hope that you can take a few minutes to read it. Click this link to the Washington Post to read Anne Midgette's thoughts about classical music over the last ten years. This high school group has the silent monk schtick down! According to this report in the Cincinnati Enquirer, the faculty of the University of Cincinnati's College-Conservatory of Music has given its dean Douglas Knehans a unanimous thumbs down. The faculty of the University of Cincinnati’s College-Conservatory of Music has written a letter to Provost Tony Perzigian, UC’s top academic officer, declaring its complete lack of confidence in Douglas Knehans, the school’s dean since fall 2008. Previously Knehans was director of the Conservatorium of Music in Tasmania, Australia. If you are looking for a last minute stocking stuffer, consider purchasing a pound of Symphony! coffee from Badbeard's Coffee or Spella Cafe. $2.00 of your purchase will benefit the Oregon Symphony's concert at Carnegie Hall in 2011. Ho, Ho, Ho! Seattle Opera's director of education Perry Lorenzo passed away this weekend because of lung cancer. This is a great loss for those of us who have benefited from the lectures that Lorenzo has given over the past 20 years in his role at Seattle opera. Seattle Opera’s General Director Speight Jenkins announced today that Perry Lorenzo, an internationally acclaimed speaker on opera and for almost twenty years Director of Education at Seattle Opera, passed away on December 19. He fought a valiant fight against lung cancer for the past seven months. He was 51. Under his leadership Seattle Opera instituted a system of preparing the 700 high school students who attend each of the Opera’s dress rehearsals. When the Opera received a grant to bring opera to students in the kindergarten-to-sixth-grades, Perry wrote and produced a 75-minute adaptation of Mozart’s Magic Flute, which is available on CD. His lectures on the Ring are also on CD. Perry had long advocated a Young Artists Program at Seattle Opera, and in 1998 this program began with him as the director. He wanted the program to be performance-oriented, and he was always present at the auditions for the ten to twelve young professionals who have come into the program every year. He encouraged the program’s expansion and its annual full-scale production in Meydenbauer Center in Bellevue. He was very proud that over 40 percent of Seattle Opera Young Artists are now making a living singing, including such major Metropolitan and La Scala artists as Lawrence Brownlee, Brandon Jovanovich, Sarah Coburn, and Mary Elizabeth Williams. A very devout Catholic, he wrote on religious matters as well as operatic. His dedication to Catholicism and his ability to introduce his religion into his lectures became a hallmark of his work. He was a great advocate of Pope Benedict and had read all of his published works. At St. James Cathedral he was very active as a parishioner and teacher. He advocated ecumenism and frequently moderated panels with members of all faiths. He also gave many popular and very well-attended lecture courses at Seattle University. Born in Hawaii and raised in Bellingham, Washington, Lorenzo graduated from Gonzaga University in Spokane. After spending a short time in the Catholic Seminary there, he decided to become a teacher. For ten years he taught at Kennedy High School in Burien prior to coming to Seattle Opera, in 1992. He is survived by his partner, Paul Hearn, and his father, Robert Lorenzo. Funeral arrangements are not complete, but the services will take place in St. James Cathedral. Seattle Opera will hold a celebration of Perry Lorenzo’s life on January 9, 2010, at 3:00 p.m. in the auditorium of Marion Oliver McCaw Hall in Seattle. In lieu of flowers, contributions may be directed to Seattle Opera’s Perry Lorenzo Fund for In-School Education, or to St. James Cathedral. For Jenkin's blog posting on Lorenzo, click here. Congratulations are in order for the members of Third Angle whose latest recording, "Chen Yi: Sound Of The Five" was just picked for the NPR's top ten Classical Music recordings for 2009. Click here for the entire list. News of the weird, from the classical music world: Conductor David Ott fell into an orchestra pit; composer Curtis Hughes wrote an opera about Sarah Palin; and baritone Bryn Terfel forgot his pants in 2009. According to this report, the Honolulu Symphony has officially filed for bankruptcy. The financial struggle of the orchestra has been very hard on the musicians, who are sticking together and trying to remain upbeat in spite of it all. That's the word in this article from the Honolulu Star-Bulletin. You can find my interview with Gregory Vajda about his new piece, "Gulliver in Faremido," in Oregon Music News today. Vajda's latest creation involves a narrator and a chamber music ensemble. So, the interview includes David Hill, who wrote the text and David Loftus, the actor who will do the narration at the performance with the Third Angle New Music Ensemble. This piece is Vajda's first US commission, and it should be a fascinating ride when it is presented on January 22nd at Kaul Auditorium. Bachxing Day has become staple Portland celebration as members of Classical Revolution PDX perform their own interpretations of Bach sonatas, cello suites, cantatas and a special performance of the Third Brandenburg Concerto in honor of their third year at the Someday Lounge. All are encouraged to bring their instruments and show Classical Revolution how they play Bach. Audience members can also join in on the fun by creating ridiculous Bach names, puns and haikus to win prizes. Mario Venzago, the former music director of the Indianapolis Symphony has been selected to lead the Northern Sinfonia orchestra, which is based in northeastern England at the Sage Gateshead complex. Venzago was forced out of his position at Indianapolis by President and CEO Simon Crookall for reasons that have remained unclear. The Swiss born artist joins a conducting roster that includes Thomas Zehetmair, music director; Simon Halsey, principal conductor of choral projects and John Wilson, also principal conductor. Venzago is conductor laureate of the Basel Symphony Orchestra and principal guest of the Deutsche Staatsphilharmonie Rheinland Pfalz in Ludwigshafen, starting next season. He also guest conducts widely and is the former principal conductor of the Gothenburg Symphony Orchestra. My colleague here at the Verb, Lorin Wilkerson, and I are singing in tonight's performance of Bach's "Christmas Oratorio" (parts 4-6) and Vivaldi's "Gloria" with the Bach Cantata Choir. Ralph Nelson is directing the concert, which includes orchestra and several soloists, including Irene Weldon, Nan Haemer, Jacob Herbert, and Byron White. The concert is at 7:30 at Rose City Park Presbyterian Church (1907 NE 45th Avenue in Portland). I hope to see you there. This evening at 7 pm, the Portland State Piano club will hold a CD release party and benefit for “My Voice Music” and “Portland Police Bureau Sunshine Division” at Sherman Clay/Moe’s Pianos (131 NW 13th Ave. in Portland). The event includes live performances by Portland State University music students. All of the proceeds and donations will go directly to My Voice Music and The Sunshine Division. My Voice Music is a non-profit organization based in Portland, Oregon that engages marginalized youth in music and performance in order to promote self-esteem, social skills and emotional expression. This organization works with local schools to provide free music programs for the youth in need. All of their services are free. The funding for their services are all provided through their volunteers and partnerships. The Portland Police Bureau Sunshine Division is a non-profit emergency food relief organization. The Division has been in operation since the early 1920’s and continues to offer emergency food relief as a result of cash and food donations from public. According to this report in the Seattle Times, Thomas Philion has announced that he will resign from his position as president of the Seattle Symphony Orchestra when his contract runs out in June of next year. Philion has been the president of the SSO for the past couple of years, and this announcement was unexpected. Let's hope that the SSO doesn't try to hire Oregon Symphony's president Elaine Calder. Also, Zach Carstensen at The Gathering Note has more analysis about the situation at the Seattle Symphony. Carstensen thinks that the SSO has experienced a lot of turbulence over the past years and Philion's impending exit is just another example of this. The Seattle Times has a very positive review of Gregory Vajda appearance on the podium with the Seattle Symphony last weekend. You can catch the review here. My interview with Michael Parsons, Mr. Classical Millennium, is posted on Oregon Music News here. Also, Oregon Music News is sponsoring a contest that gives away tickets and other cool things if you make an intelligent comment on the article. Click here to find out more details about the contest and good luck! Acclaimed Baroque oboist Gonzalo X. Ruiz is featured with Monica Huggett in a new recording by the Ensemble Sonnerie of Bach’s Orchestral Suites For A Young Prince. This recording has just received a Grammy nomination in the category for Best Small Ensemble Performance. Ruiz was in town last weekend to play with the Portland Baroque Orchestra, and I got to do a brief interview with him. Congratulations on your Grammy nomination! Ruiz: Thanks! This nomination feels really great! We do make a lot of recordings, and each time we feel that that each recording should get noticed. But this one, in particular, I had hoped would get noticed, because this had been my baby. It had been years in planning. It’s my version of the four Bach suites – what I think are the original versions – including a brand new reconstruction of the second suite. So, I really put myself out there, and it’s extremely gratifying that this recording was nominated. So you did a lot of research for this music? Ruiz: I had access to high-quality photo reproductions of all the original materials. Is this the first Grammy that you’ve been nominated for? Ruiz: Yes, I’ve been on orchestra recordings that have been nominated for Grammys, but this one is more personal, and I’m much more involved with my name on the front cover and all that. When did you do the recording? Ruiz: About a year ago. It typically takes about six months to get a CD to market after you recorded the music. It got some nice reviews after it came out, and then I got the email that it’s on the Grammy list. Are you still based in Boston, because I thought that you now teach with Monica Huggett at Juilliard in New York City? Ruiz: Yes, I’m still in Boston, but I’ll probably move to New York this summer. That’s the current plan. My wife and don’t want to make the move now because we have two elementary school kids. Congratulations again on the nomination and best of luck to you. For a detailed description of Ruiz’s contribution to the Bach recording, go to the ArchivMusic website. Also, this music will be performed in Portland Baroque Orchestra concert series featuring Ruiz and Huggett on May 14-16. Alex Ross, the classical music critic of The New Yorker, commented positively on the recent production of "Esther" at the New York City Opera and mentioned Christopher Mattaliano specifically. And the production came off handsomely. Christopher Mattaliano's 1993 staging, a sleek affair that relies on projections rather than hulking sets, has aged well." Every year Chamber Music Northwest chooses a few extremely talented musicians for its Young Artists Fellowship. Those who are selected benefit from the program in many ways, including coaching from top-tier pros who come to CMNW's summer festival. Anyone string player, wind player, or pianist who has the chops and is between the ages of 12 and 22 can apply. For details about the program, click here. Last night I heard the Tallis Scholars give one of the best choral concerts I have ever heard. My review of the concert is in Oregon Music News. Here's a great way to stetch your donation to the arts: contribute to Work for Art. This is a non-profit organization that will double your donation and forward it to a local arts group. Also, if you donate $60 or more, you will receive a handy Arts Card that will give you some great 2 for 1 ticket deals! Donations to Work for Art support more than 80 vital arts and culture organizations every year—encompassing dance, visual arts, music, film arts, theater, cultural arts, and arts education. Donors can be confident that their dollars are supporting well-run groups that have undergone a rigorous grant application process. Any 501(c)(3) arts and culture organization based in Clackamas, Multnomah, or Washington Counties is eligible to apply for these grants. A full 100% of donations that Work for Art receives goes straight to our funded arts organizations. In appreciation of your gift of $60 or more to Work for Art, we’ll send you an Arts Card. This offers you 2-for-1 tickets at hundreds of arts and culture events for a full year at more than 50 organizations. We’ll also send you an e-newsletter that tells you where you can use your Arts Card each month. My review of the Oregon Symphony concert with Yefim Bronfman is in Oregon Music News here. You can find my review of this past weekend's Portland Baroque Concert with Alexander Weimann in Oregon Music News. Also I interviewed Carla Moore, PBO's concertmaster in Oregon Music News as well. As any of you who read my weekly Operaman’s blog will know by now I am no musicologist. Furthermore, let me tell you right off that I was Northwest Reverb’s fourth-string option to review last Friday evening’s concert given by the Portland State University Symphony Orchestra. So your reading this is a bit like you going to a Minnesota Vikings game expecting to see Brett Favre and getting Sage Rosenfels. You may just catch him on a day that he's great of course, but that's unlikely and he’s not what you paid good money for. That having been said, I did attend that concert and have some moderately cogent thoughts about what I saw and heard so try and stay with me here, okay? If your idea of a wonderful orchestral concert includes going into the intermission with memories of a grand Beethoven overture still sounding in your head but fighting with the sparkling tunes of the Mozart Piano Concerto that followed it, then the first half of Friday’s concert afforded you a great opportunity to stay home in the warm, pour yourself a scotch and watch a rerun of National Lampoon’s Christmas Vacation or, perhaps, World Wrestling’s Friday Night Smackdown. If, however, you did go to Saint Mary’s Cathedral you would have found the first half of the gig opened with Heiner Goebbel's Surrogate Cities Sampler Suite which segued into Ernest Bloch’s Concerto Grosso Number 2. And if you went, then I hope you had as splendid a time as I did. I should begin by mentioning the venue. I have been to only one concert previously in this church and was very disappointed by the sound. Not so on Friday evening. The sound was warm without being mushy and from my seat (about a half of the way back and on the aisle,) I was able to hear every note as clear as a bell. I attribute this to conductor Ken Selden having paid very close attention in rehearsal to matters such as balance within the orchestra and vis-à-vis the audience. Thank you, Maestro. It made a huge difference to my level of enjoyment. One of the problems with giving a piece a lengthy and somewhat curious title, and then naming all of the 'movements' after baroque dances, is that it induces expectations in the audience. In this case, one might well have looked at the programme and said to ones self "Ah. Somehow this work is going to make me think of a city within the context of pieces of music that will remind me of 18th century dances." Well, I think Mr Goebells is having a little private joke here. Alternatively, while listening to Lully and Rameau and reading the record sleeve that referred to things such as Menuet and Gavotte, he was doing some really wicked acid. Not for a moment, however, did that detract from my enjoyment of the work which I found to be quirky, whimsical and imaginative. But the movement marked Bourée? I know Bourées, Mr Goebbels and that was no Bourée. The imaginative orchestration includes a sampler, a computer-programmed instrument that produces synthesized sound in accordance with instructions 'written in' to the machine ahead of the performance. Lisa Marsh was a fine soloist on this instrument. I am somewhat ashamed to have to admit that I came very late to the Ernest Bloch musical party in celebration of the 50th anniversary of his death. It has been going on all year, largely without me, but I finally showed up at the door and brought a good bottle of wine so they let me in. I am very happy. My first exposure to Bloch was Elmar Oliveira’s stunning performance of Baal Shem at Chamber Music Northwest’s Summer Festival, which James Bash reviewed here. More recently I heard the Portland Youth Philharmonic perform two interludes from his opera Macbeth. I have also taken the opportunity to listen to some recordings and I no longer need to be persuaded that Bloch wrote music of the highest order and that Oregon is justly very proud that he chose to make it his home. Bloch’s Concerto Grosso Number 2, written in 1952, is scored for just sixteen string players. Now, if you are designing a concert for an amateur orchestra that is a bold choice because with such small forces, every instrumental part is, at some point, very exposed, and matters such as faulty intonation are laid bare for all to hear. Maestro Selden played a brilliant card by bringing in some ringers – in this case four string players from the Third Angle New Music Ensemble. This seeding of the strings had two excellent results. Firstly, of course, the Third Angle players provided a solid base in support of the other instrumentalists. Additionally, though, their presence raised everyone else’s game. What we got as a result was string playing that was disciplined, virtually pitch-perfect and displaying remarkable ensemble. The piece itself is just gorgeous! It put me very much in mind of the works for string orchestra of Vaughan Williams. I do not mean this in the sense that Bloch was ripping off VW’s style or that he was displaying himself as a Vaughan Wannabee. I mean that he wrote a piece that is lush, romantic, dense and complex while being melodic and charming. It also demonstrated what you can do with strings if they are not fighting to be heard over a brass section. I liked it so well I have just purchased if from Amazon.com. And had there been a recording of what I heard on Friday, that is the one I would have bought. That's how well I liked it. After the intermission we were treated to a brilliant performance of the Elgar Cello Concerto with soloist Hye Jun Yang. Ms Yang won first prize in the 2009 PSU Symphony Concerto Competition. It's not hard to see how she did that. From the opening notes of the first movement she showed technical command and emotional restraint which combination allowed us to sit back, comfortable in the knowledge that she was up to the physical demands of the piece, while letting the music move us without her trying to superimpose dramatic effect. There were one or two minor problems of intonation in the first movement. I put them down to nerves. When set against the gorgeous overall effect she achieved they were inconsequential. I mention them not to nit pick, but because she knows they were there and to omit any mention of them would be to deny the attention I paid to her playing and the degree to which she drew me in to her first-rate performance. In the lento section of the second movement, Ms Yang gave us ravishing tone and the virtuoso passages of the final movement's allegro were presented in a fluid and unaffected style. Throughout, Maestro Selden had his orchestra provide exemplary support. I should make specific mention of the woodwind section which was crisp and very well balanced. This was a totally captivating performance and it was received with the enthusiasm it deserved. Addendum and clarification from James Bash: I did contact Stephen because I and my colleague Lorin Wilkerson and regular guest reviewer Aaron Barenbach were not available to review this concert. Stephen might say that he is fourth-stringer, but he is a first-rate writer. Oregon Symphony's resident conductor Gregory Vajda is the conductor on a recording of music by Péter Eötvös that has been nominated for a MIDEM Classical Award 2010. The recording is of Eötvös's "As I Crossed a Bridge of Dreams." It is among three recordings nominated for MIDEM Classical Award 2010. Monday night's concert by the Tallis Scholars is almost sold out. That's the news I just received via email from Linda Magee, executive director of Chamber Music Northwest. CMNW is sponsoring this concert by the Tallis Scholars as part of its Encore Series. This vocal ensemble is the ne plus ultra when it comes to Renaissance music. For more information, click here. Two performances this weekend will help to stock up the shelves at the Oregon Food Bank. The Oregon Symphony concerts with pianist Yefim Bronfman are gasking patrons to write a check for the Oregon Food Bank, because Bronfman is a big supporter of food banks. He gave a concert for the Food Bank for New York City at Grand Central Station, and you can read about it here. Dr. John Richards will conduct the Metropolitan Youth Symphonic Band this Friday at the Arlene Schnitzer Concert Hall for the last time. Richards played principal tuba with the Oregon Symphony for over 50 years and is one of the most remarkable and energetic people I have ever met. He can play almost any instrument, has a collection of tubas that stretches back to the earliest kinds of tubas, has extensively travelled the globe, grew up on a farm in Idaho, served with military bands during WWII, has a doctorate in psychology and taught at Lewis & Clark College for many years. Richards has also rescued many tubas and other brass instruments from schools that were shutting down their music programs. He started the Tuba Christmas event and was the director of the MYS Symphonic Band. Richards will conduct the "March of the Belgian Paratroopers" at the concert on Friday. The Grammy nominiations are in. Monica Huggett has been nominated for her conducting of Bach's Orchestral Suite for a Young Prince with the Ensemble Sonnerie. Yefim Bronfman, who is in town to play with the Oreogn Symphony, has been nominated for his playing of Salonen's Piano Conccerto. But aside from the Messiah concerts, there are many other holiday concerts. One of the best places to find out about them is to look at the PDX Choral Calendar. This calendar contains dates, times, and links in a simple format. Please take a look at this calendar, and you'll find a concert that will help you to get into the holiday spirit. I interviewed Jack Allen, the head honcho at KQAC, and published our conversation in Oregon Music News. I've been out of town and will be catching up with events in Portland soon. Wintersong is the Portland Symphonic Choir's annual multi-cultural holiday concert with something for everyone. This year's version will offer music for choirs, brass, percussion, plus narration by Gretchen Corbett, singalongs, and guest choir Rex Putnam High School. The highlight of the concert is Britten’s “Ceremony of Carols” arranged for all four voices, with harp accompaniment. Based on Renaissance-era songs, the movements alternate between haunting, lilting, and vigorous singing with challenging tempos and harmonies. Britten sets a mood of worship and anticipation that makes you imagine crystalline Christmas nights of long ago. Gabrieli’s fabulous “Hodie Christus Natus Est” tosses peals of joyful cries between multiple choirs. The King’s Singers made “A Little Christmas Music” famous, with its warm and familiar carols such as the Wassailing song, “Little Drummer Boy,” and more. A Swahili song of praise with percussion, “Mungu ni pendo,” adds a bright bounce. In contrast, Shaw’s arrangement of Vittoria’s “O Magnum Mysterium” is achingly hushed. Representing Hanukkah, the Choir sings an exciting new arrangement of the traditional hymn to the Rock of Ages, “Maoz Tsur.” And Epstein’s arrangement of “Ozi ve Zimrat Yah (My Strength),” is an exotically rhythmic setting of Psalm 118. To honor another ancient tradition, “A Winter Solstice Ritual” combines calm chanting with an organ accompaniment trilling sounds of nature to hearken back to primeval ceremonies of the sun. Joining us this year with their youthful energy will be Rex Putnam High School choir, directed by John Baker. This outstanding group has placed in the top four choirs 16 years out of 22 in the OSAA State Choir Championship, and has earned three state titles. 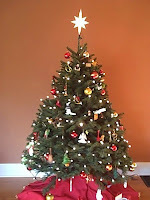 They will lift their voices in several inspiring songs of the season. The concert takes place on December 12th at 7:30 pm and Sunday, December 13th at 2:30 pm at St. Mary’s Cathedral (NW 18th & Davis in Portland). Tickets : $25 for open seating/ $35 for reserved seating. Students 1/2 price, accompanied children under 12 free. Contact Box Office Tickets at www.boxofficetickets.com, call 503-205-0715 or toll free at 1-800-494-8497; or go on the Choir web site at www.pschoir.org. I'm thankful for all of the terrific musicians who are willing to share their talents. Portland, in particular, is blessed with people who love to make music. Music helps to define our culture, and our lives are improved through music. 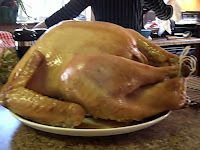 I'm thankful for all of you who have stopped by to read this blog. Some of you may have missed an earlier posting regarding my writing for Oregon Music News. Yes, you'll now find more of my writings over there than here at Northwest Reverb, but I intend to keep Northwest Reverb going, and my colleague, Lorin, will be sharing his thoughts from time to time as well. 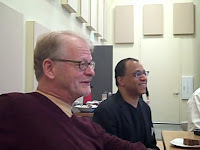 My interview with conductor Ken Selden about the collaboration between the PSU Symphony and Portland Ballet is in Oregon Music News here. Oregon Music News has my review of the Oregon Symphony's concert this weekend. This is a terrific concert that shows off its principal members, and the orchestra is doing it again this evening. My review of the Columbia Symphony's Shakepeare concert is in Oregon Music News here. According to this article by Mark Swed in the LA Times, Sir Simon is riding a new wave of popularity after years of pushing the orchestra too far afield. Mei-Ann Chen, former music director of the Portland Youth Philharmonic, is currently on the conducting roster at the Baltimore Symphony (Marin Alsop's band). Click here for a link to Chen's bio on the BSO website. During the 2009-2010 season, Ms. Chen will make debuts with the Alabama Symphony, Chicago Sinfonietta, Fort Worth Symphony, Kalamazoo Symphony, Memphis Symphony and Toronto Symphony, as well as return engagements with the Atlanta Symphony and Taiwan National Symphony. Sir George is on fire! Nilsson is incredible - as is the VPO! Thanks to Bob Priest for finding this gem. "Arrive sober, stay awake, stay to the end and don't take a bribe unless it is big enough to allow you to retire in comfort for the rest of your life." Thanks to Monica Hayes (the Education & Community Engagement Director at the Oregon Symphony) for this tidbit! Anne Midgette, the classical music critic of the Washington Post, talks with NPR's Tom Huizenga in this fascinating article. You hear her talk by clicking on an audio snippet or read the text. 1) The Recording Industry Implodes: What Happened? 2) Wait A Minute! I'm Marketing My Own Compositions: How Has the Internet Impacted Musicians? 3) Can the Internet Save the Soul of Classical Journalism? 4) The Sound of Music: Are Composers Writing Differently? 5) Box Office Bummer: Why Are Ticket Sales Slumping? 6) Pavarotti Is Dead: Does It Matter? 7) Exciting Youngsters: Can They Reignite The Classics? 8) Don't Touch That Dial! Will Classical Radio Survive? 9) A Decade In Transition: Is Classical Music In Better Shape Now? 10) A Classical Crystal Ball: What's In The Future? This review of mine is also in Oregon Music News. The concert took place at the Old Church on Sunday evening (November 15). You can find my review of the Brahms Requiem that was performed by the Portland Symphonic Choir on Sunday afternoon (November 15th) in Oregon Music News. Please click here to read my review of the Portland Philharmonic concert that took place on Saturday evening (November 14) at the Schnitz. In Oregon Music News, I've published an interview with the four members of the Oregon Symphony who will be featured this weekend in Mozart's "Sinfoinia concertante." The interview contains a lot of information about this piece, which has been reconstructed by Robert Levin - partly because the original has been lost. You'll find some humor sprinkled throughout the interview as well. The interviewees - Carin Miller, David Buck, Martin Hebert, and John Cox. All of them are principals with the orchestra, and they take turns ribbing each other. I was at the Portland Youth Philharmonic concert last night and noticed an ad for the Marrowstone Music Festival in the program. The ad lists the staff at Marrowstone and it includes on Oregon Symphony principal trombonist Aaron LaVere (who is currently on leave from the orchestra and playing in Korea) and one our nation's very best clarinetists, Todd Palmer. Marrowstone is scheudled to run from July 25 through August 8 next summer in Bellingham, Washington. See the comment below from Marrowstone's Britt Madsen. Apparently, Aaron LeVere will not be on the Marrowstone staff this summer. In today's Columbian newspaper, I've got a preview of the Vancouver Symphony's concerts with guest conductor Richard Rintoul. According to this report in dramma per musica (aka Bob Kingston)the Third Angle New Music ensemble will be the pit orchestra for Portland Opera's production of Trouble in Tahiti. Congrats to Ron Blessenger and co. This production will feature the Portland Opera Studio Artists and will take place in the Newmark Theatre. If you can read Chinese, it would be a great help to Ron Blessinger and the 3Aers. Click here for more details. Brett Campbell (Willamette Week's classical music guy) has an article in the Wall Street Journal about the influence of Henry Cowell and a music festival that will feature Cowell's works. Click here to read the story. On November 12, 1925, cornetist Louis Armstrong made the first recordings with a group under his own name for Okeh Records in Chicago, Illinois. The group, called Louis Armstrong and his Hot Five, recorded his original compositions, "Gut Bucket Blues" and "Yes! I'm In The Barrel" (Okeh 8261) as well as "My Heart" composed by his wife Lil Hardin who was the pianist in the band. (The flipside of the 78rpm record on which the latter was issued, Okeh 8320, was "Armstrong's composition "Cornet Chop Suey" recorded three months later on February 26, 1926.) Armstrong's Hot Five and subsequent Hot Seven recordings are widely considered to be the earliest masterpieces of recorded jazz. One thing I admire about Charles Noble, principal violist with the Oregon Symphony, is the candor he brings to classical music from the perspective of an orchestra member. His most recent blog post tells of his failure to get a job with the LA Philharmonic. That's Dudamel's new band, if you haven't been keeping up with things. The baseline salary for orchestra members there is over $100,000, and Noble was aiming for the assistant principal violist job, which would pay a lot more. Here's a short clip from the roundtable last week with Philip Glass. In the video, Glass talks about "Orphée." I posted the roundtable discussion on Oregon Music News here. For my review of "Orphée" click here. Seattle Repertory Theatre turns to music as a central theme with playwright Michael Hollinger’s hilarious, moving, and insightful work Opus at the Leo K. Theatre. The play offers a detailed look into the frenetic existence of the imaginary world-class Lazara Quartet as they begin preparations for the gig of a lifetime at the White House. They have only one week to prepare the monumental Beethoven string quartet Opus 131 with brand-new violist Grace (Chelsey Rives), a fresh-faced, idealistic young woman who presents a stark contrast to the world-weary companions who have made music together for decades. Hollinger’s insight as a violist who has played many string quartets was obvious; judicious name-dropping, high-brow insider’s jokes and the occasional below-the-belt one liner were present throughout, and even when the play got more serious as it moved toward the climax there were countless, genuinely hilarious moments. His portrayal of the volcanic frustrations and sometimes uncomfortable intimacy thrust upon men of mercurial temperament who have worked together so closely for so long, on something as personal as this music, never comes off as anything other than sincere. The love, cynicism and rancor between the men, and sometimes between them and their music, paints an honest, multi-layered portrait of these complex relationships. The delivery by the five actors was by and large extremely convincing, and their timing was impeccable in the oft razor-sharp repartee called for by Hollinger’s dialogue. Of particular note was Allen Fitzpatrick’s brilliant performance as Elliot, the harried, antagonistic first violinist who is tormented by the fact that his lover Dorian (Todd Jefferson Moore), who is a much better musician than he, had been relegated to the viola despite Dorian’s superior skills, his ability to “hear things that we don’t,” as the second violinist portrayed by Shawn Belyea puts it. The structure of the work is non-linear and consists of many flashbacks that flesh out the circumstances behind Dorian’s mysterious disappearance, shortly after erratic behavior forces his ouster from the quartet at the beginning of the play. One feels genuine sympathy for the plight of this bi-polar genius whose unpredictable personality dooms any attempt to seal the rifts in his disintegrating relationship with the maddeningly self-absorbed Elliot. Rapid-fire changes of the minimalist set served to highlight the quick firing-off of the flashback sequences, and the soundtrack was poignant and familiar; lots of Bach, and Beethoven. Hollinger succeeds marvelously in portraying the passion, love and conflict the characters feel toward their music and each other; indeed one of Hollinger’s stated purposes was to use the intimacy of the players as an allegorical tool to portray the inter-play between the instruments in a string quartet. One might have liked a bit more (indeed, any at all) finger-movement by the actors as an added verisimilitude, but thanks to Hollinger’s clever writing, the time-span in which the audience watches the group ’play’ music without moving their fingers across the neck is relatively short. The structure is such that the play takes about 90 minutes and is uninterrupted by intermission, so that by the time the shocker at the finale takes place, the audience is breathless and wondering if it’s actually over. The standing ovation was well-deserved. My review of Portland Opera's "Orphée" will be posted on Oregon Music News tomorrow. I'll also have a posting about last week's roundtable with Philip Glass. I'll provide links to these articles tomorrow. Update: in case you missed the link to the review, click here. I've written an article about five members of the Portland Symphonic Choir for the November issue of The Hollywood Star newspaper. The piece highlights the backgrounds and musical contributions that these singers have made through the PSC. It also mentions the upcoming concert on Sunday in which the choir will perform Brahms Requiem with Richard Zeller and Georgia Jarman. Jarman, btw, is featured as Eurydice in the current Portland Opera production of "Orphee." The article for the Hollywood Star is not available on line. However, you can find copies of the paper in NE area coffee shops. All of the interviewees live in NE Portland. They are Jerry and Mary Nelson, Sue Nelson, Maria Hein, and Jim Maddry. Pianist Julia Hwakyu Lee presents music of Bach, Liszt, Amy Beach and Prokofiev. Lee teaches music at Portland State University and the University of Portland. Admission $15, $10 for seniors 65 and over, $5 for students with ID. Tickets available at the door. Alexis Hamilton and Diane Syrcle join forces again in a program that includes The Flower Duet from Puccini's Madama Butterfly, Mira o Norma from Bellini's Norma, selections from Aaron Copland's Old American Songs, Kurt Weill's Broadway Album, plus arias from Rusalka, La Favorita, Samson et Dalila, and Tosca. Tickets $15 per person; seating is limited. Dessert and silent auction are included. 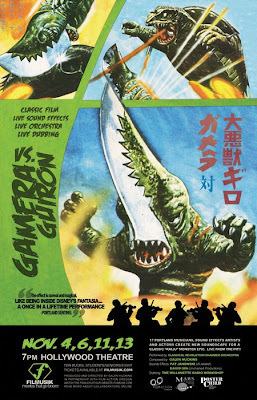 Filmusik, an enterprise that combines film with live entertainment in a hearkening-back to the days of yore, presented the first performance of the Japanese cult classic 'Gamera vs. Guiron' last night at the Hollywood Theatre. Members of Classical Revolution Portland delivered live music by composer Galen Huckens, the Willamette Radio Workshop provided voice actors and live sound effects were by David Ian, Pat Janowski and friends. An enthusiastic showing of geeks, film buffs, and scenesters of all schools and ages showed up for the premier. Huckens' composition began the film with a pleasant, pastoral spacescape, accompanied by a rich voice-over monologue extolling the wonders of the limitless universe. 'Over-the-top' was the watch-phrase of the evening, as the foley (sound effects) crew and voice actors paid imaginative homage to the campy production values of the movie. The intense concentration and accurate timing of the foley artists was something to behold all evening long; many times all four of them were producing more than one effect simultaneously, with an impressive variety of objects: balloons, rattles, voice synthesizers, even a hand-cranked wind machine came into play. The kaiju genre of films (kaiju are monsters, more or less; think of Godzilla as the king of the kaiju) are renowned for their hokey production limits and histrionic emotional scope, and because of that they have retained a large cult following to this day. Gamera, a giant, fanged, flying space-turtle who can retract all his limbs and turn them into smoky, flame-belching jet engines, was well-known as a 'friend to children,' as the film repeatedly stated. The main protagonists, two young boys who board an abandoned spacecraft and mistakenly launch themselves to the evil alter-ego of Earth, planet Terra, are emotionally attached to Gamera. The whale-song-like wailing of the foley artists in providing Gamera's voice succeeded in portraying him as a sympathetic, heroic creature, and the audience delighted in this, clapping, hooting, cheering him on in battle, and commiserating with his suffering. All of the performers involved, while definitely revelling in the kitsch, also seemed to understand the taken in its entirety, the film was not meant to be a laughable rollick, though it is hard to imagine it as anything else viewing it through our eyes today. Filmusik has succeeded brilliantly once again; Huckens seems to be getting better and better at what he does. The entire live production manages to capture all the camp, humor, and drama inherent in this battle of foam-rubber titans. At the beginning of the film the children lament "Gee, grownups have no dreams." Fortunately they are wrong in that observation, as this darkly comedic reverie at the Hollywood theater so vividly points out. There are three performances left: November 6th, 11th, and 13th. This is not a good sign of the times: Barry Johnson, aka Mr. Portland Arts Watch is taking a buyout from The Oregonian. I didn't always agree with Johnson's ideas, but he added a lot to conversation about the Portland Arts scene. His last day at the O is December 18th. I hope to read more of Johnson's ideas on the web somewhere. As soon as I find out where he will be posting, I'll let you know. He might pop up at Art Scatter, which also has a posting on this announcement This is another dark day for culture in Portland. Philip Glass himself - at today's roundtable - confirmed that Orange Mountain Music is recording all four performances of "Orphée," which opens this Friday at Keller Auditorium! This is an historic first for Portland Opera. It will be released commercially. Congratulations! In an historic first for the company, Portland Opera’s upcoming production of the west coast premiere of Philip Glass’ Orphée will be commercially recorded by Orange Mountain Music. Mr. Mattaliano was also clear in his appreciation for the cooperation from all of the unions involved—the American Federation of Musicians, the American Guild of Musical Artists, and the International Alliance of Theatrical Stage Employees. “This recording would not have been possible without their welcome and appreciated participation,” he said. Michael Riesman, music director and principal keyboardist of the Philip Glass Ensemble, will produce the CD for Orange Mountain Music. Mr. Riesman was also the producer for the other two commercial recordings in the Cocteau Trilogy: La Belle et la Bête and Les Enfants Terribles. Orange Mountain Music’s mission is to archive all of Philip Glass’ music so that as many of his compositions as possible are available commercially. The commercial release of the Portland Opera Orphée is currently set for the spring of 2010 in a two-disc CD complete with libretto and production photographs. Portland Opera’s production of Glass’ Orphée opens Friday, November 6, with additional performances on Nov. 8, 12, and 14. All four performances in the 3,000-seat Keller Auditorium will be recorded live. Most artists have, from time to time, experiences as an observer of another artist that leave them wishing they practiced their art more. Experiences of an artist performing at the pinnacle of their art. Sunday’s concert at the Newmark Theatre by pianist Jonathan Biss was such an experience. Technique, interpretation, and emotional investment all combined in a varied selection of solo piano works that cast Biss’s considerable talents in a very favourable light. Opening the concert with selections from Felix Mendelssohn, Biss immediately displayed the skills and artistic maturity that have made his reputation. Mendelssohn’s Prelude and Fugue in E minor, Op. 35, No. 1 flashed by in a blur of smooth yet intense playing, Biss’s fingers only leaving the keys infrequently to keep his glasses from falling forward. Miscues were rare and almost unnoticeable, a difficult enough feat when performing the piano works of such a gifted composer and musician. The melody of the prelude, in an inner voice, rang true and clear. The complex structure of the fugue appeared reminiscent of the works of Bach, a composer that Mendelssohn admired and emulated though at the time Bach’s works were not as widely known and respected as they are today. Continuing in the same vein, Biss then played three selections from Mendelssohn’s famous Songs Without Words. The first, Duet in A flat Major, was an impressive display of hand positioning as the melodic lines were equally distributed between the two. At times Biss’s hands were on top of each other, fingers going about their business with speed and precision. Happiness in A Major followed, a welcome glimpse of Mendelssohn’s sense of humor. Elegy in D Major rounded out the trio nicely. All three were played superbly, and Biss showed every sign of being as swept up in the emotional shifts as the audience. Finishing up with Mendelssohn was his Variations serieuses, Op. 54. Mendelssohn avoided for some time the writing of variations as the style had fallen out of favor with “serious” composers. His foray into the genre however, was every bit as prestigious as his other works for piano. Once again Mr. Biss put on a display of technical skill and emotional sensitivity, playing his way through a dazzling selection of variations with what appeared to be genuine pleasure. The Theatre conscientiously provided a screen above the stage, presenting the audience with a clear view of Mr. Biss’s hands, yet at times his fingers moved with such speed and dexterity that the image became blurred as technology failed to keep up. Jumping forward in time, Biss then played five selections from Gyorgy Kurtag’s Jatekok. Originally intended as pedagogical pieces for young players, the compilation eventually expanded to several volumes of small works exploring the innumerable “colors” of sound possible to be coaxed from the piano. Sparse, dynamically diverse, and (at times) extremely playful, the five selections showed a different side of Biss’s playing. At certain points the piano was so quiet and restrained that the sound was almost drowned out by the infrequent shifting of the audience. The sonorities were clear and unadorned, bringing to mind the works of both Bartok and Webern. Approached with all the skill and focus of the earlier pieces played, these selections provided both a departure from the usual fare of solo piano works, and an unexpected highlight of the concert as a whole. Without pause, Biss followed the Kurtag selections with the lesser-known Adagio in B minor, K.540 by Wolfgang Amadeus Mozart. A short, melancholic piece, perhaps written for the composer’s own enjoyment, it followed the Kurtag selections as a particularly well thought out piece of concert programming. From Romantic, to 20th century, to Classical, Biss’s treatment of the music remained skillful and intent. The emotional connection to all the music was apparent, as Biss’s left hand would rise from the keys, almost conducting the music of the remaining hand. Sudden crescendos or halts would cause his hands to fly up and his whole posture to rock backwards, as if almost being bucked from the bench by the force of the music. Through all, it appeared truly to be the movements of a music lover lost in the swirl of sound rather than pretentious posturing. After a short intermission, Biss ended the concert with Franz Schubert’s Sonata in A Major, D.959. One of three piano sonatas written near the end of his life, Schubert showed his mastery of Classical forms, mixing them with longer Romantic melodies, creating quite a large work (that behooves the smart musician to pack a lunch before setting out on the journey). Presented in four movements, the piece stretches over a large area, both temporally and harmonically. Adding to his list of attributes a prodigious memory, Biss presented the sonata with no lack of skill and panache. Winding through the opening Allegro, the multiple themes stood out proudly, contrasting nicely against the new material presented in the development. The second movement, Andantino, moved boldly through some far-reaching harmonic shifts, their sudden appearance seeming to shock Biss as much as the audience. The third movement, Scherzo-Allegro vivace, displayed more of Schubert's original take on Classical forms, and the finale, Rondo-Allegretto, interestingly subdued, brought the massive piece to such a satisfying close that the audience demanded an encore. Biss deserves the reputation he is still earning as an energetic, mature, and intuitive musician. His skills combined with the intriguing program choices of last Sunday created a musical event that tied together a sizable piece of the compositional history of the piano. The enjoyment he garners from sharing his gift is apparent and bodes well for both his future and that of his audiences. Aaron Berenbach is studying music composition with Bob Priest at Marylhurst University and pursuing a career as a singer/songwriter/composer/teacher. 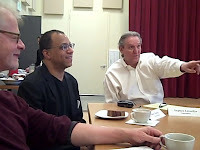 An interview that I did with David Hattner, Portland Youth Philharmonic's maestro, is now posted at Oregon Music News. For those of you who may have missed it, my interview with composer Tomas Svoboda (including some snippets of sound clips from his latest works is available here. The Oregon Symphony made music with two guest artists on Saturday evening (October 31st) at the Arlene Schnitzer Concert Hall. The ensemble was led by Claus Peter Flor, a German conductor who is the music director of the Malaysian Philharmonic Orchestra and is well-known for his work with the Dallas Symphony over the past decade. Guest violinist Stefan Jackiw, a 29-year-old American virtuoso also made his debut with the orchestra, which played works by Ravel, Mozart, and Beethoven. Beethoven’s 5th Symphony was the big number on the program, and Flor led the orchestra with an uptempo approach that never looked back. The piece was punctuated with sharp attacks and a robust sound from the horn section. The violins nicely leaned into the phrasing at times and the bass violins showed off some blistering fast fingerwork in the third movement. Even in the slower sections of the piece, Flor didn’t ask the orchestra to linger over notes very long. Yet there seemed to have been a loss of focus near the end of the piece. The flute trill, for example, sounded wonky, and the exuberant energy of the finale was present but not totally convincing. Guest violinist, Stefan Jackiw delivered a strong performance of Mozart’s Violin Concerto No. 4. The way Jackiw held his violin reminded me at times of Midori, showing a remarkable sensitivity to the orchestra’s sound yet giving impression that he was playing for each individual in the audience. Jackiw demonstrated a fine sense of nuance throughout the piece like when he deftly increased the sound of some descending triplets, or spun out a sweet, singing tone. He had cadenza in each of the three movements, but he first was the most flamboyant and may, I think, be one that was developed by Joseph Joachim, the great 19th century Hungarian violinist. The first piece on the program, Ravel’s “Le tombeau de Couperin,” absolutely sparkled. Flor used his hands rather than a baton to coax a soft, nimble, and poignant sound from the orchestra. Amidst the lush chords and enchanting atmosphere was a superb performance by principal oboist Martin Hebert. Hebert seemed to effortlessly create sounds that ranged from fluttering and playful to ruminating and mild. The overall effect was gemlike. I just heard that Portland Opera's production of "Orphée" might be commercially recorded by Orange Mountain Music. This is an exciting development! I'll let you know if I hear more about this. I've been invited to join some other journalists at the Portland Opera offices for a roundtable discussion with Philip Glass, who will be in town because of his opera "Orphée." 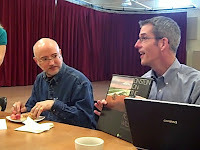 The roundtable with Glass is will take place on November 3rd at 11:15 am at the Portland Opera offices on (211 SE Caruthers, just south of OMSI). There is no recording of this work, but I do have recording by the Stuttgart Chamber Orchestra playing the Interlude from Act II. This snippet from the opera bubbles along and sounds really great. Paul Otto Manz was an outstanding composer and organist. He died Wednesday evening (October 28th) in St. Paul, at the age of 90. The new group of regional composers who want to promote new music. This concert will feature works by some of its members. For a preview of the concerts, please read my article in Oregon Music News. Ralph Nelson conducts the choir and orchestra in a program that features Bach's Cantata #147 "Herz und Mund und Tat und Leben" and Handel's Chandos Anthem #9 "O Praise the Lord with one Consent." Portland Piano International presents Jonathan Biss, who will play works by Mendelssohn, Mozart, Schubert, and Kurtág. The Opera and PAM are presenting "Glass: A Portrait of Philip in Twelve Parts," to help whet your appetite for the upcoming Portland Opera production of Glass's "Orphée." Alan Pierce, former bass trombonist with the Oregon Symphony, makes batons for a lot of conductors. 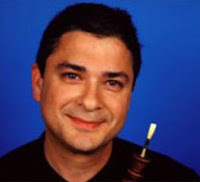 He recently made 13 batons for Hannu Lintu, who has guest conducted the Oregon Symphony several times. Lintu is the artistic director and chief conductor of the Tampere Philharmonic Orchestra in Finland. Steven Zopfi directs the Portland Symphonic Choir in a performance of Brahms Requiem at 3 pm on November 15th at the Arlene Schnitzer Concert Hall. The concert includes the Portland Sinfonietta with featured soloists: Georgia Jarman, soprano and Richard Zeller, baritone. Zeller is a an Oregon native who is on the roster at the Met in New York City. Jarman is an up-and-coming talent who is singing this month with the Portland Opera in its production Orphée. The performance of Brahms Requiem will be in German with English supertitles. According to this report in the Chicago Tribune, Elizabeth Hurley, a dynamo administrator at Metropolitan Opera is now the new executive director of the Grant Park Music Festival. Carlos Kalmar, the Oregon Symphony's music director is also the music man at Grant Park, so he's got a new colleague in Chicago. This season, both Northwest Reverbers (Lorin and myself) are singing with the Bach Cantata Choir, and the ensemble has its first concert coming up this Sunday (November 1st). The Bach Cantata Choir of Portland will open its 5th concert season with a concert featuring works by Georg Friedrich Handel (1685-1759) and Johann Sebastian Bach (1685-1750) on Sunday, November 1 from 2:00pm-3:15pm at Rose City Park Presbyterian Church, 1907 NE 45th Ave in Portland, Oregon. The concert, under the direction of conductor Ralph Nelson, will feature a performance of Handel’s stirring Chandos Anthem #9, “O Praise the Lord with One Consent” and Bach’s Cantata #147, “Herz und Mut und Tat und Leben.” Both works contain themes well known to most audiences – the Handel is based on the familiar hymn tune “O God, Our Help in Ages Past”, and the Bach contains “Jesu, Joy of Man’s Desiring”. The concert is free and open to the public. A free-will offering will be taken. Doors open at 1:30pm. A silent auction, whose proceeds benefit the operations of the choir, will immediately follow the concert in the parlor adjacent to the sanctuary. Featured in Handel’s Chandos Anthem #9 will be soprano Nan Haemer, countertenor Tim Galloway, tenor Byron Wright and bass-baritone Jacob Herbert. In Bach’s Cantata #147 the soloists will be soprano Gina Osborne, alto Irene Weldon, tenor Byron Wright and bass-baritone Jacob Herbert. The works will be accompanied by a small chamber orchestra. John Vergin will provide the organ continuo. This concert features the Bach Cantata Choir – a choir of 55 professional or semi-professional voices, drawn from many of Portland’s finest choirs.